If you saw me wearing these would you be all "It's a lot of look but you pulled it off" or more "Who pulled that look? Lisa Frank?" I say go for them if you can think of 3 outfits to make with things already in your closet. To make these not as kiddie, I could picture them with a slightly oversized slouchy knit sweater in a neutral color, a blousy feminine top (again, in a neutral color), or something structured like pairing the feminine top with a blazer over it. I think the key to steer away from Lisa Frank, hah, is to avoid matching too much with colors in the print and to opt for basic colors like cream, black, navy, camel, etc. instead of a bright. Hope my 2 cents helps! I kinda love these, and they have great reviews on anthro's site -- I say go for it. I may even have to join you, though I'm tempted by the white version as an alternate to plain white summer jeans! I don't think they're easy to pull off persay but it is doable! I would probably buy them from a place like H&M or forever first though to see how much I wore them. That video is hilarious! Love the video!! Sooo many things are true! ha, too funny, i saw that same video yesterday. honestly, maybe i'm too simple, but i'm thinking the only thing that would go with these pants is a basic white top. and if you can only pull one look from it, the pants would not be worth it. now if you have lots of money to burn, yeah, buy 'em, wear 'em once, but it just doesn't seem like a versatile piece for the wardrobe. I'd give you a thumbs up! I can always appreciate someone who can take a fashion risk. And I actually like these...I'd wear them myself! I think these are gorgeous but wouldn't wear them — I don't think I could pull them off. But maybe if you kept everything else super simple you could. I think you could definitely pull these off! Okay, I have to say that beyond the original sh*t girls say videos, I hadn't been a huge fan of the others (funny or not, a meme can get old quickly). HOWEVER. I hadn't seen these fashion ones and they're hilarious. Thanks for sharing! Haha I wonder how many times that guy cracked up before getting it right! I could see it. totally do it, someone is and you might as well be the first. haha Lisa Frank!! Man those were the days!! I definitely think you could pull them off! Not everybody can, but those with style can absolutely do it! I would totally be jealous of you. I really want a pair for myself so I might be biased though. I like em! I don't know...it feels a little like pants I wore in elementary school...I'm sure you would still be adorable though! I wouldn't be caught dead in those. But if you like them, go for it. I don't know. I'd NEVER do it, so you can be the one in the floral pants. I'm working on color. This is just too much for me. I need to wrap my mind around this one. They're making me anxious. But I love you no matter what you wear. I like them, I agree with you its a bit intimidating but I'm sure you can ROCK them! I adore these! You could really pump them up and wear a bright striped top with a really chunky knit cardigan and roll up the bottoms of the pants and pair with a fab pair of bootie heels or fun flats. I think you should get them and if someone asked me if Lisa Frank styled my outfit I'd prob be super excited lol I loved the brights from LF circa the early 90s! I'd say it's a lot of look but you'd pull them off, fo sho. 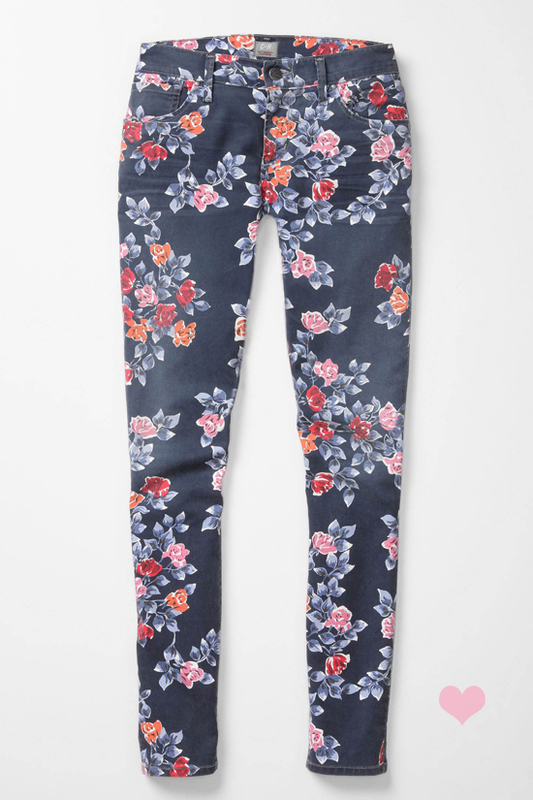 I think these skinnies are fantastic! The colors are perfect. Go for it! They'd be darling on you!